Are you looking to create a beastly buffet or scary snacks for Halloween? Here are some tips to make things easy and eerie all at once. I was born on Halloween, and it’s my absolute favorite holiday. It’s a day when the spooks come out, costumes are welcome, and food gets freaky. 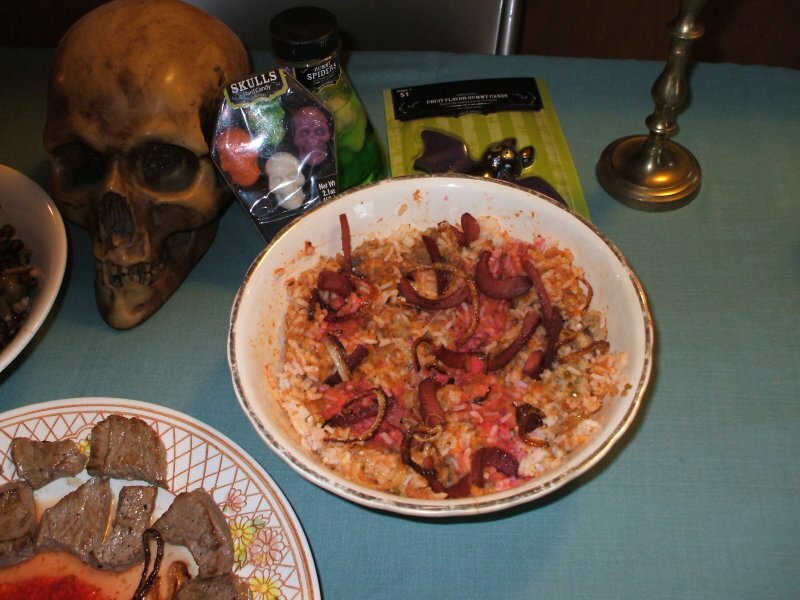 Every year my husband makes me a ghoulish buffet for the occasion, since it’s Halloween, my birthday and our wedding anniversary. Between the two of us, we’ve come up with some great yet inexpensive ways to add some madness to the menu. Food coloring is one of the easiest ways to add a creepy twist to your food. Red is always good since it looks like blood, but other colors, combined with the color of the food, can have great effects. Add a little bit of every color in the box to your pasta when you boil it, and it becomes a wonderfully gross shade of gray. Add red to green foods to turn them brown, green to red foods for the same effect, or red and green to other foods to get an almost black look. If you can eat it, you can usually color it, so the possibilities are nearly endless. Just be sure you’re using a food safe coloring. Jell-O can be great for making things gross. Not only does it come in a myriad of flavors and have the ability to be molded in nearly any shape, it’s also wiggly and weird. You can put things inside your gelatin, like grapes or gummy worms to make it look even freakier. (If you put any non-edible items in your gelatin, make sure guests know to be careful when eating it.) You can also mash Jell-O for a gross-looking edible addition to other foods. You can find creepy, scary and gross things just by looking closely at various foods. A deviled egg topped with a black olive ring and a small bit of tomato suddenly looks like a giant eye. Green beans in beet juice look like severed goblin fingers. Radiatore pasta dyed gray and mixed with a red-dyed cheese sauce looks like stirred brains. Corn syrup can become edible blood, as can beet juice. Crushed chocolate cookies make great dirt, and partly melted candy bars make great poop or rocks. Dyed linguini becomes flat worms, and cut and dyed pita bread becomes bat wings. 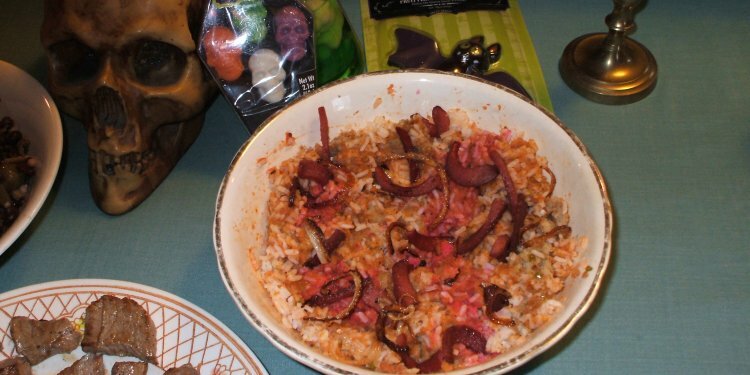 If you take a good look around, you can see the creepy and gross aspects of many normal foods. You can easily make a great gross or scary feast without spending a lot of money. It’s fun to come up with new uses for food, and it’s a great activity to share with kids. Children are especially talented when it comes to seeing the “eww” in normal food. Have fun, and enjoy the looks of fright and disgust of your guests’ faces.